In October 1863, Robert E. Lee moved north against the Union Arm at Centerville, Virginia. In late July 1863, after the conclusion of the Gettysburg campaign, the Union Army of the Potomac, under Maj. Gen. George G. Meade, and the Army of Northern Virginia, under General Robert E. Lee, settled exhaustedly into their respective camps. The Federal troops bivouacked on the north bank of the Rappahannock River near the village of Warrenton, Virginia, while the Confederates took up positions south of the river near Culpeper. Having won a major defensive victory—however narrowly—at Gettysburg, Meade considered going over to the offensive. He confided to Union General-in-Chief Henry W. Halleck on July 28 that he was “making every effort to prepare the army for an advance.” But before any forward movement could be undertaken, Meade first had to discover the enemy’s exact location. To that end, he sent out a large reconnaissance force spearheaded by Brig. Gen. John Buford’s 1st Cavalry Division and supported by the infantry in Maj. Gen. John Newton’s I Corps. On August 1, Buford’s 3,500 troopers splashed across the Rappahannock and started down the line of the Orange & Alexandria Railroad to Culpeper. At 10 am, the bluecoats came into contact with Confederate horsemen guarding the area, Brig. Gen. Wade Hampton’s 1,000-man brigade, temporarily commanded by Colonel Pierce M.B. Young. As Union horsemen curled around both his flanks, Young conducted a grudging four-mile fighting withdrawal to Brandy Station. A further retreat brought the contending forces within three miles of Culpeper. At 4 pm, Maj. Gen. J.E.B. Stuart, commander of the Army of Northern Virginia’s cavalry corps, appeared on the scene with reinforcements. Soon Buford’s men were surrounded by a welter of saber-wielding Confederate cavalry and quickly arriving infantry. Not wanting to bring on a general engagement, Buford moved northeast toward the Rappahannock River. By nightfall he made contact with the II Corps, which had passed to the south of the waterway. Outnumbered better than 2-to-1, the Confederates broke off the action and marched back to Culpeper. Between August 3 and 9, Confederate cavalry skirmished repeatedly with Buford’s division, which continued to hold a bridgehead on the south shore of the Rappahannock near Rappahannock Station. The purpose of the brawls was to determine what Federal strength was on the south bank of the river and if Meade intended to bring his entire army across or retire to the north shore. The answer came on August 9 when Meade, concerned about his supply situation, withdrew all his soldiers to the north bank. Robert E. Lee, guarding against an enemy turning movement that could trap him between the Rappahannock and Rapidan Rivers, transferred his army south of the Rapidan. By the last days of August, Lee had 60,000 men concentrated on the south side of the lower Rappahannock near Fredericksburg. As always, his thoughts tended toward taking the offensive. Writing to I Corps commander Lt. Gen. James Longstreet, Lee observed, “I can see nothing better to be done than to endeavor to bring General Meade out and use our efforts to crush his army while in its present condition.” Ever the gambler, Lee formulated a plan to cross the Rappahannock somewhere between Fredericksburg and the junction of the Rappahannock and Rapidan and hit Meade from the rear. However, events in another arena of the war caused the stratagem to be shelved. In a brilliant campaign of maneuver, Union Maj. Gen. William S. Rosecrans’ Army of the Cumberland had driven its opponent, the Army of Tennessee, entirely out of Middle Tennessee that summer. This deprived the Confederacy of a vast stretch of territory that supplied the Southern military with manpower, horses, and foodstuffs. The loss of the vital area moved the war to the outskirts of Chattanooga, Tennessee, the gateway to northern Georgia. The crisis in northern Georgia prompted the Richmond government in early September to detach Longstreet’s corps of 14,000 men from the Army of Northern Virginia to stabilize the situation in the West. This left Lee with only 46,000 troops to face Meade’s 97,000 soldiers, presenting Lee with no real opportunity to bring the fight to the Army of the Potomac with any real chance of success. The Federal commander did not feel so constrained. Meade had been contemplating an advance on Richmond that would start at Fredericksburg and consist of an overland campaign from there to the Confederate capital. But first he had to confirm whether the rumor of Longstreet’s departure from Virginia was true. To that end, he initiated another reconnaissance in force over the Rappahannock River on September 13, using his entire cavalry corps: Buford’s 1st Division, the 2nd Cavalry Division under Brig. Gen. David M. Gregg, and Brig. Gen. Hugh J. Kilpatrick’s 3rd Cavalry Division. The II Infantry Corps under Maj. Gen. Gouverneur K. Warren was assigned to support the cavalry effort. After the Union cavalry traversed the Rappahannock and joined forces at Brandy Station on the Orange & Alexandria Railroad seven miles northeast of Culpeper, Kilpatrick tangled with 1,000 troopers and an attached horse artillery battery under Colonel Lunsford Lomax. The Confederate mounted brigade of Brig. Gen. William H.F. “Rooney” Lee, Robert E. Lee’s son, joined the fray in a number of clashes south of Culpeper before Stuart withdrew his horsemen to the Rapidan River. Casualties for the opposing forces were light, the most notable being the wounding in the leg of Union Brig. 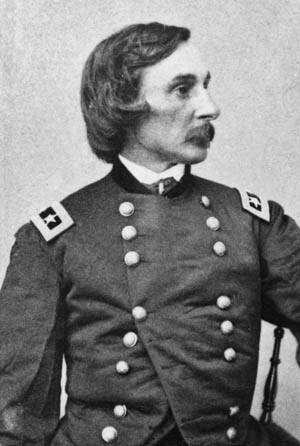 Gen. George A. Custer, which knocked him out of action for the next three weeks. Brigadier General David Gregg’s Federal troops skirmish with Confederates under Colonel Lunsford Lomax during one of several reconnaissances in force on September 13, 1863. Cavalry commander J.E.B. Stuart withdrew his own forces rather than provoke a larger attack. For the next 10 days, the Federal cavalry sought in vain to discover a path across the Rapidan in the face of the defensive front put up by Confederate infantry along the river. On September 21, in an attempt discover a way to flank the enemy position on the Rapidan by way of a move to the west, Buford’s and Kilpatrick’s cavalry embarked on an extended scout around the Confederate left flank at the Robertson River. The next day, eight miles south of where the Federals crossed the Robertson, at a place called Jack’s Shop, Buford ran into Stuart. While Buford pinned Stuart from the north, Kilpatrick circled around to strike the Confederates from the south. Surrounded, Stuart was forced to fight his way out to the south toward Gordonsville. On the 23rd, the Federals retraced their steps and recrossed to the north side of the Rapidan. Buford’s successful foray across the Robertson River portended an advance by Meade around Lee’s left, but that was not to be as the pendulum of war swung once more. In the West, Braxton Bragg’s forces defeated Rosecrans at the Battle of Chickamauga (September 19-20), resulting in the siege of the Army of the Cumberland inside Chattanooga. Rushing to succor the beleaguered Federal force, the Lincoln administration sent the 20,000 men of the XI and XII Corps to Tennessee on September 25. With the disparity in enemy numbers somewhat reduced (76,000 troops to Lee’s 46,000), and with the knowledge that Longstreet would not be returning to Virginia for some time—he had been detailed to conduct what turned out to be a fruitless campaign in East Tennessee after the victory at Chickamauga—Lee was determined to strike a blow. His determination to attack included his hope of bringing on a successful battle at his advantage, forcing the enemy to abandon areas of northern Virginia before the harvest season ended and preventing further detachments of Union forces from going to Tennessee. Lee’s operational plan was reminiscent of his campaign against Maj. Gen. John Pope in August 1862. He envisioned a rapid move by his army around the Union right and into its rear. Then Meade’s army, like Pope’s the year before, hemmed in between the Rappahannock and Rapidan Rivers, would be forced to fight Lee on ground of the Southerner’s choosing. Scheduled to commence on October 10, the Confederate advance would see the foot soldiers of Lt. Gen. Richard S. Ewell’s II Corps jumping off from Madison Court House, forming an inner arc circling around Meade’s right. At the same time, Lt. Gen. Ambrose Powell Hill’s III Corps, also starting from Madison Court House, would constitute another but wider curve around the enemy’s right flank. Eagle-eyed Union Signal Corps officers watch General Robert E. Lee’s army in camp from an observation stand on Pony Mountain near Culpeper, Virginia, in September 1863. Shielding the turning movements of the 38,000 Confederate infantry from prying eyes fell to Hampton’s cavalry division, 2,500 sabers strong, directly commanded by Stuart. While the bulk of the army went forward, Fitzhugh Lee’s cavalry division and some infantry brigades, 7,000 fighters in all, were tasked with pinning down the opposing army along the Rapidan River, 20 miles away. Lee hoped that his movement would come as a surprise to Meade. It would not. 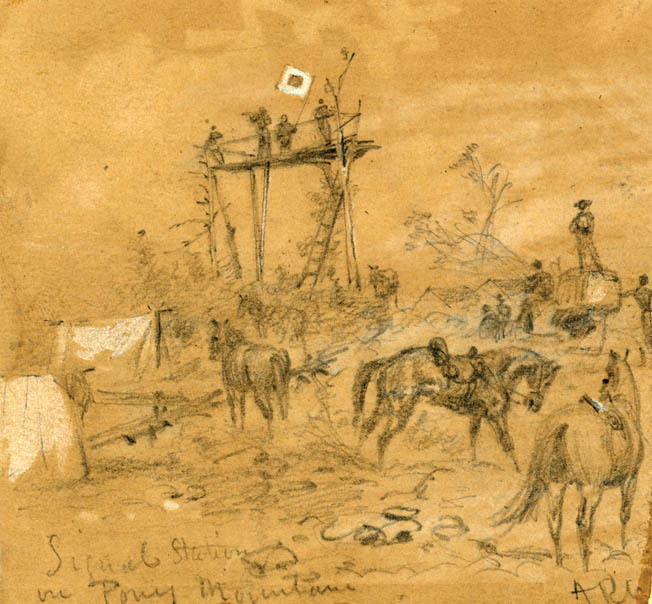 On October 6, four days before the Confederates rolled out of Madison Court House, Union signal corpsmen on Pony Mountain, eight miles southwest of Culpeper, intercepted Confederate messages disclosing the imminence of the Confederate offensive. On October 9, signal men from the same height spotted the enemy concentrating at Madison Court House. Misinterpreting his enemy’s redeployment as the precursor of a Confederate retreat toward Richmond, Meade got his army in motion and planned to send infantry and cavalry under Buford across the Rapidan on Lee’s right flank and capture Orange County Court House, an important supply base for Lee’s army. Hedging his bets in case Lee’s movement turned out to be against his army’s right, Meade stationed Kilpatrick’s cavalry and some infantry, 8,000 men in all, at the village of James City on his right, northeast of Madison Court House, as a blocking force. At 6:30 am on October 10, the Bristoe Station campaign started when cavalry under Stuart stormed over the Robertson River at Russell’s Ford, overwhelming Union horsemen stationed there. Three hours later, Stuart and the two brigades of cavalry accompanying him found themselves stalled in front of James City by tenacious fighting on the part of Kilpatrick’s troopers and infantry from Brig. Gen. Henry Prince’s 2nd Division, III Corps. Behind Stuart the infantry columns of Ewell and Hill labored over poor roads and numerous swollen creeks. They entered camp that evening after having covered only 10 miles. By midafternoon, Meade had concluded that the Army of Northern Virginia was not withdrawing but was moving to outflank him. In response, he rearranged his various corps. The II Corps moved to strengthen the right wing, with III Corps to the II’s left and V Corps positioned near Culpeper to act as a central reserve. By day’s end, three-fifths of the Federal army’s infantry and one-third of its cavalry were near James City facing Lee’s oncoming battalions. On Sunday, October 11, the full impact of the Confederate advance was felt by the Army of the Potomac. One of Meade’s aides, Lt. Col. Theodore Lyman, witnessed the army “all busy, packing and striking tents. All the wagons went ahead, the 1st & 6th Corps followed on the south side of the railroad [the Orange & Alexandria] and the 2nd and 5th [Corps] on the north, while the 3rd [Corps] went more to the north still, crossing at Freeman’s Ford [on the Rappahannock River].” Meade had pulled his army back from the Rapidan and set it in motion for the north bank of the Rappahannock. Meanwhile, Buford, who had been on reconnaissance below the Rapidan River, after brisk fighting with Fitzhugh Lee’s cavalry near Morton’s Ford, slipped away from his Confederate pursuers and rejoined the main army. Marching briskly in formation, veteran infantry from the Army of the Potomac cross Broad Run on October 14, 1863, before the Battle of Bristoe Station. Abandoning James City that morning, Kilpatrick fled to Culpeper. As Stuart closed on the south side of the Rappahannock while his opponents scrambled to reach its north bank, a large cavalry battle occurred at Brandy Station in the late afternoon. At one point both mounted forces, on parallel routes, raced for the high ground around the station. The Federals, under Buford, barely won the race. Regardless, Kilpatrick’s men found themselves cut off from their comrades, and only a bold charge led by Custer and his brigade allowed the isolated troopers to join their friends on the hill. By nightfall, the Union cavalry had safely escaped across the river. While the opposing cavalry fought at Brandy Station on the 11th, Ewell’s and Hill’s footsloggers were able to cover only another 10 miles that day. Meanwhile, the Federal infantry corps completed their crossing of the Rappahannock and spread out to cover the river from just below White Sulphur Springs, where Gregg’s cavalry was on guard, south to Kelly’s Ford. On October 12, Lee planned to move his army to the right of the enemy and cross the Rappahannock; after that it would move to Meade’s rear at Warrenton. Again, Ewell would take the inner and more direct route toward the enemy right, moving along the Culpeper-Warrenton Turnpike. A late start, muddy roads, and slow-moving divisional trains allowed for only eight miles that day. Hill’s men, moving farther to the west and hampered by miserable roads, managed barely 12 miles, which nevertheless brought them to within seven miles of Meade’s right flank by day’s end. 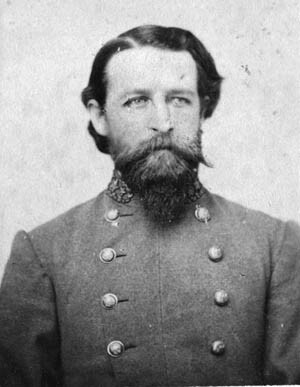 Meanwhile, Meade, intent on locating Lee’s infantry, decided to send a combined cavalry and infantry force made up of Buford’s division and the II, V, and VI Corps under Maj. Gen. John Sedgwick south of the Rappahannock. Sedgwick moved to Brandy Station and took the high ground there. As the Federal army commander pushed half his army to Brandy Station, Lee, with Stuart’s troopers in the lead and the rest of his army in trail, made for the Union right. The Confederate advance was held up by cavalry of Gregg’s division at the village of Jeffersonton, two miles from the Rappahannock. It was not until 4 pm that Confederate cavalry cleared the area of Federals and moved on to the river. A Southern cavalry charge at the Fauquier White Sulphur Springs bridge secured the crossing point two hours later, sending the Union defenders of Gregg’s command fleeing. Confederate infantry from Ewell’s corps immediately reinforced their cavalry brethren on the north bank. As Gregg’s men fell back eight miles to Fayetteville, they uncovered the Union III Corps’ right flank at Freeman’s Ford, farther to the south. Stuart pushed on that evening with two brigades of cavalry and occupied the town of Warrenton, which lay six miles northeast of the Rappahannock and six miles behind the Army of the Potomac’s right. Lee did not move his infantry over the river that day since he did not know the full extent of the enemy’s dispositions in the region. Union forces at Bristoe Station occupied an easily defensible flat plain between Broad Run and the Orange & Alexandria Railroad. Learning of his opponent’s advance on his flank late that night, Meade issued orders for Sedgwick to pull back from Brandy Station and cross to the north bank of the Rappahannock. On the 13th, I, II, and III Corps were ordered to proceed to the vicinity of Warrenton; V and VI Corps proceeded to Warrenton Junction, 10 miles southeast of Warrenton, to form a reserve. That same day, Buford was tasked with guarding the divisional, corps, and army trains, a total of 27,000 wagons and other vehicles, while Gregg’s and Kilpatrick’s units were posted to watch the army’s right and rear. As the Army of the Potomac prepared to move east, the Confederate infantry of Ewell and Hill managed only 13 miles for the day, bringing them close to Warrenton by nightfall. The afternoon of the 13th saw the Federal army move from around Warrenton Junction toward Bristoe Station, 22 miles from the Rappahannock River. The army marched in two columns. As the Federals trudged on, Lee, seeking intelligence on the whereabouts of the enemy, sent Stuart with three mounted brigades on a scout from Warrenton to Catlett’s Station, 10 miles to the southeast and three miles north of Warrenton Junction. The cavalry leader started before noon. Nearing his objective, he unknowingly placed himself in a position between the two roving columns of the Army of the Potomac: Kilpatrick’s and Gregg’s cavalry divisions and the II and III Corps traveling north five miles south of Warrenton, and Buford’s men, the I, V, and VI Corps moving along the Orange & Alexandria Railroad five miles farther south of the northernmost Federal column. The army was heading for the secure position on the heights at Centreville, 20 miles from Washington. At 4 pm, Lomax’s cavalry brigade ran into Maj. Gen. William French and his III Corps near Auburn, five miles south of Warrenton. Lomax attacked but was driven off and retired to Warrenton. Meanwhile, Stuart and his 3,000 troopers near Catlett Station found themselves trapped between the two Union forces making their way toward Bristoe Station. Stuart hid his command in a wood below Auburn and spent the night no more than 300 yards from Warren’s II Corps’ burning campfires. At dawn on the 14th, Lee ordered Ewell’s corps, then near Warrenton, to march to Stuart’s rescue. At 6 am, Ewell’s leading division under Maj. Gen. Robert E. Rodes came in contact with the Union II Corps division led by Brig. Gen. John C. Caldwell and some Federal cavalry. At the same time, Stuart ordered his horse artillery to fire on Caldwell. This in turn prompted Brig. Gen. Alexander Hays’ II Corps division to attack Stuart’s newly discovered position. Stuart then ordered a successful break though the Federal lines to the southeast. As Caldwell battled Rodes and then Maj. Gen. Jubal Early’s infantry along with Fitzhugh Lee’s cavalry, the other infantry units of the Federal II Corps made their way from Auburn to Catlett’s Station. Four hours after the fight began, both sides disengaged and proceeded to their assigned targets for the day: the II Corps to Catlett’s and Bristoe Stations, while Ewell’s Confederates marched to Greenwich on the northern margin of the Union army. The unwanted combat at Auburn had cost the combatants about 100 casualties each. While Ewell fought at Auburn, A.P. Hill, with some of Fitzhugh Lee’s troopers in the van, marched his three infantry divisions east on the Warrenton and Alexandria Turnpike, pushing retreating units of the Federal III Corps before them until the Union forces outpaced their pursuers. At midmorning near Buckland Mills, Lee’s cavalry engaged in a series of running fights with Kilpatrick’s men, who had been assigned by Meade to block the turnpike leading east to Centreville. This was important since the Confederate cavalry fell behind Hill’s advancing infantry as the latter approached Bristoe Station, eight miles up the railroad from Catlett’s Station. The absence of Southern cavalry at Bristoe Station meant that Hill would go into battle without knowing about the presence of Warren’s corps nearby. It proved to be a deadly mistake. By noon most of Meade’s army and its enormous trains were near Centreville and safely out of Lee’s reach. The sole exception was the army’s rear guard, Warren’s and Gregg’s formations, just departing Catlett’s Station. Warren marched along the rail line with Brig. Gen. Alexander Webb’s 2nd Infantry Division and two artillery batteries on the north side of the right of way; Hays’ 3rd Division marched parallel with Webb on the south side, and Caldwell’s 1st Division and the corps trains followed Hays and Webb on both sides of the tracks. The two brigades of Gregg’s cavalry division guarded the marching infantry, Colonel John P. Taylor’s 1st Brigade shielding Warren’s left, while Colonel J. Irvin Gregg’s 2nd Brigade took up the rearguard position. About 1 pm, Warren’s nearest support, Maj. Gen. George Sykes’ V Corps, had just pulled back over Broad Run Creek two miles to the north of Bristoe Station, mistakenly believing Warren was out of danger of being cut off. In fact, at that time Hill’s Confederates were closer to the Broad Run Creek crossing than Warren was. Hill, seeing the last of Sykes’ men crossing to the west side of the creek, determined to attack at once. “No time must be lost,” he told aides. With two of his three divisions not yet up, Hill ordered the only unit readily available, Maj. Gen. Henry Heth’s division, to form a line of battle half a mile north of Bristoe Station and one mile west of the village of Milford on Broad Run Creek. Brig. Gen. John R. Cooke’s brigade formed on the right, with Brig. Gen. W.W. Kirkland’s men to Cooke’s left and Brig. Gen. Henry H. Walker’s brigade behind Kirkland. The Confederate strike force numbered 4,700 men. Hill decided to keep Heth’s remaining two brigades in reserve. The area the battle was fought over consisted of open fields studded with patches of thick pine trees, heavy undergrowth, and low ridges that were perfect for concealment of troops. The terrain was well suited for defense. “Well, I will advance,” said Cooke, “and if they flank me, I will face my men about and cut my way out.” He would soon have the opportunity to prove his words. Soon after Hill gave Heth the order to advance, a column of men was seen approaching the Confederate right. Hill assumed that this was the lead regiment of Anderson’s division. In fact, it was the leading unit of Warren’s corps, Colonel Francis E. Heath’s 1st Brigade. At 2:15 pm, elements of Heath’s command supported by Lieutenant T. Fred Brown’s Battery B, 1st Rhode Island Artillery, moved across Broad Run at the railway bridge. Once on the east side of the stream, the gunners went into battery to confront the Confederates coming from the north. The Union infantry fell back to the west side of the creek, where they took a defensive stance in a railway cut facing the enemy. Minutes later, Heath was joined on his left by Webb’s 3rd Brigade under Colonel James E. Mallon. 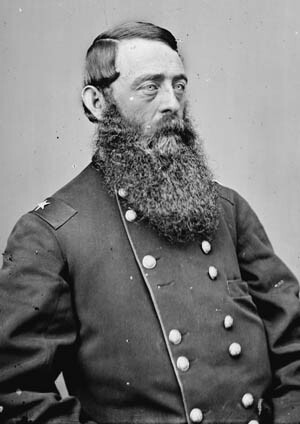 General John R. Cooke (J.E.B. Stuart’s brother-in-law). Cooke was wounded in the battle. Distracted by the fire from Heath and Mallon, Cooke and Kirkland veered toward the entrenched Federals. At 2:30 pm, Hill directed the units to ignore the enemy in the rail cut and advance toward Broad Run. Cooke chose to disobey Hill’s command and led his and Kirkland’s men toward the point of greatest danger, the massed Union troops under Heath and Mallon. Hidden from his view, Walker missed Cooke’s and Kirkland’s new march route and continued southeast toward Broad Creek. At this juncture Anderson appeared and Hill immediately ordered him to send two brigades south to aid the Confederate attack. At 2:30 pm, reinforcements from Colonel Joshua T. Owens’ Third Infantry Brigade, Hays’ division, and Captain William A. Arnold’s Battery A, 1st Rhode Island Artillery arrived to bolster the Union position. These were soon joined by Batteries F and G, 1st Pennsylvania Light Artillery, under Captain R. Bruce Ricketts. The Union forces, about 3,000 infantry and 20 cannons including the battery across the creek, were augmented by the arrival of Colonel Thomas A. Smyth’s 2nd Brigade of Hays’ division. In fact, the onrushing Confederates were heading straight into a trap prepared for them by Gouverneur Warren. His deployment behind the embankment and at right angles to the ford created a deadly enfilade. It was, said an admiring Union officer, “as fine a trap as could have been devised in a month’s engineering.” For a few minutes the Confederates stopped and exchanged rifle volleys with their adversaries in the cut. Both Cooke and Kirkland went down wounded. Despite men falling by the score from enemy fire, the arrival of a friendly artillery battery, which lent close support, motivated the Confederates to charge forward. As the butternut wave hit the blue line, the latter’s close-range musket fusillades brought down dozens of the attackers just 40 yards in front of their positions. “We were mowed down like grain before a reaper,” said one Tarheel. In the 27th North Carolina alone, three color bearers went down in quick succession as they grabbed the falling colors. The Federals suffered too. Webb’s horse was shot from under him, and Mallon was mortally wounded. Parts of Mallon’s and Heath’s line on the Union right were pierced by Kirkland’s men, if only momentarily. The Confederates crossed to the south of the railway and poured small arms fire into Heath’s right rear and engaged in some close-quarter bayonet fighting. A deadly fire from Brown’s four guns across Broad Run forced the exultant attackers back north of the tracks. On the Union extreme left, Smyth had no sooner reached his position at 3:15 pm, when he was attacked by two brigades from Anderson’s division. At the height of Anderson’s assault, which carried them into the rail road cut, men and cannons from Caldwell’s formation came up and repelled the surging Confederates. By 4 pm, the rest of Caldwell’s division appeared and anchored the Union left. Part of one brigade crossed Broad Creek to support Brown’s little battery. At the same time, Cooke’s and Kirkland’s badly beaten units had fallen back 600 yards from the Federal front. Hill formed a new battle line. Ewell’s corps had arrived on the field, and the fresh units formed the new Confederate right nestling against Kettle Run, a stream half a mile west of Bristoe Station. The opposing artillery opened on each other for half an hour, but little damage was done to either side. An hour later, supported by two batteries, Rodes’ division took the bridge over Kettle Run on the Union left but was not strong enough to deliver a decisive attack against the foe in that quarter. Darkness ended the Battle of Bristoe Station at 6:30 pm. Under cover of night, Warren silently moved his men safely east of Broad Run Creek. The largest infantry encounter of the campaign had cost Lee’s army 1,300 killed, wounded, or missing, with another 433 taken prisoner, as well as five artillery pieces captured. Warren’s losses amounted to 586 men. 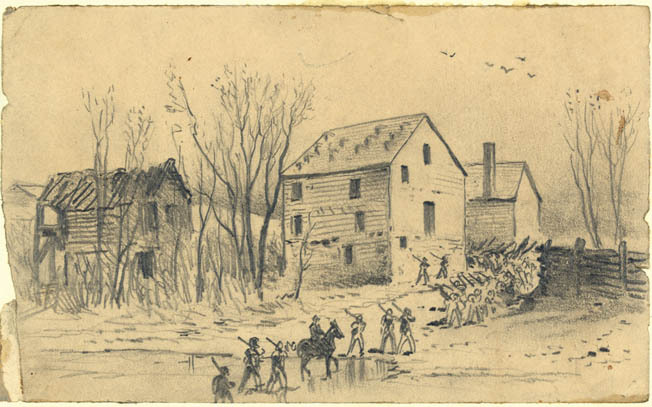 Another battlefield drawing from Alfred Waud’s sketchbook of the action at Bristoe Station shows a Rhode Island artillery battery firing on Maj. Gen. Henry Heth’s advancing Confederates. His commanding general agreed with that assessment. After the battle, Lee was reported to be in a “very ill humor when it came to General Hill,” and some sharp words were exchanged between the two concerning Hill’s conduct of the battle. When Hill attempted to explain what happened at Bristoe Station, the ordinarily polite Lee cut him off abruptly. “Well, general,” he said, looking at the dead North Carolinians littering the ground below them, “bury these poor men and let us say no more about it.” The relationship between Hill and Lee was strained until Hill’s death at Petersburg in 1865. After the battle, Meade assumed a strong position near the old Bull Run battlefield, and Lee gave up his hope of turning his opponent out of it. 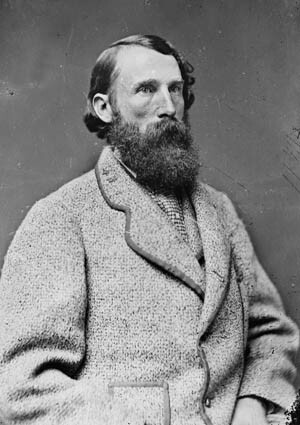 With his own lines of communication broken with the destruction by the Federals of the Orange & Alexandria Railroad, Lee elected to withdraw south of the Rappahannock. The autumn campaign had done little to alter the war’s strategic situation. No Federal troops were hurried back to Virginia from the West; Lee could not hold the territory he marched through north of the Rappahannock; and the Army of Northern Virginia did not inflict any serious damage on the Army of the Potomac. On the contrary, Lee had suffered losses in men and horses that he could ill afford and found himself significantly weakened for future offensive activities. Looming in the future was the figure of the Union Army’s new commanding general—Ulysses S. Grant—who would not give Lee time to breathe, much less recuperate. Tags A.P. Hill, Alexandria, Army of Northern Virginia, Army of the Cumberland, Army of the Potomac, Battle of Brandy Station, Battle of Bristoe Station, Battle of Chickamauga, Battle of Gettysburg, Chattanooga, Chickamauga, Confederacy, Fredericksburg, general george armstrong custer, General George G. Meade, general james longstreet, General John Buford, General Richard S. Ewell, Gettysburg, gettysburg campaign, Henry W. Halleck, J.E.B. Stuart, John R. Cooke, Overland Campaign, Petersburg, Rapidan River, Rappahannock River, Richmond, Robert E. Lee, Union Army, W. W. Kirkland, Wade Hampton, william rosecrans.